The story of two not-so-new-anymore dog owners and an extremely cute (new to the city of Toronto) beagle named Duke. I recently stumbled (somewhat randomly, by reading Amazon.com book reviews) upon a lesser-known dog training author named Kevin Behan who wrote the book Natural Dog Training back in 2001. I recently bought and read the book and want to share this with everyone. So, just as a bit of background, we are strong proponents of positive training methods. The behaviorist who helped us turn Duke around got us focused on classical counter-conditioning and positive training methods such as treat-based rewards. It's worked really well. The great thing about learning about Natural Dog Training is that as a philosophy or approach to dog training, it doesn't directly contradict positive method or clicker training whatsoever. The approach can actually strengthen and improve your results (it has for us!). The basic tenant of Natural Dog Training is that all dogs have an innate desire to make prey, chase prey, and bite. In the wild, dogs work in groups to hunt down animals that are much larger and stronger than they are - dogs are most satisfied and content as they work together and ultimately get to sink their teeth into the moose or deer or whatever they're going after. The key here is "with their owner". By offering and engaging activities like fetch, tug of war, hide and seek, "push", and sit/stay games, and rewarding Duke with praise, food, and an object to bite (in our case, a squeeky toy), we've strengthened our relationship with Duke in just a couple of weeks. The most noticeable change is Duke's recall! In the past, we had almost zero recall. The only way to pull him back towards us was to bribe him with a squeeky toy. Now, just calling him gets him to run towards us with full enthusiasm! As a book, Natural Dog Training has a few shortcomings. Firstly, it's editing is weak and there are grammatical/spelling errors that I do overlook. Secondly, in some places, its wordy and difficult to follow. Thirdly, Behan advocates both positive (treat based rewards) as well as negative punishment (choke/prong collars). Lastly, and related to the third shortcoming - the ideal audience for this book is someone who has had a fair amount of hands on obedience training experience (ie. you're already somewhat competent at dog training) - for the uninitiated, the instructions would be difficult to visualize and execute. On that note, Behan advocates the use of a pinch collar to refocus a dog - too many ignorant dog owners abuse those training tools - the margin for error is too large, especially without hands on expert supervision. Want to give it a shot? There are four fun games you can start incorporating into your daily outings with your dog. Check out www.naturaldogblog.com by Neil Sattin. Here are the specific articles that describe the fun games you can play starting tomorrow! Recently, Duke chewed up his Ikea dog bed and we weren't able to repair or replace it in time. Last night we had him sleep on a towel instead of his regular dog bed and he ended up waking up once every hour all through the night. Tonight after coming home from work, I had a very bad walking experience with Duke. He was highly distracted (or focused on sniffing snow and grass) and non responsive to my voice. He was extremely dog reactive and howled ballastically at everything. When I was coming home, I was trying to figure out what it was. Lack of exercise? Change in environment? (It recently snowed 30cm, which has changed the landscape of our neighborhood quite a bit) Something to do with snow? (It was last year when it started snowing that Duke's on-leash aggression became its worst). Hyedie suggested that the lack of sleep could be a huge reason for his sensitivity today. Last year, Duke had kennel cough when I was away on a business trip and because of this, both of them were up all night as Duke would wake himself up frequently as he coughed and gagged. The next day, he was impossible to walk. So for now we are going to make sure he gets solid shuteye every night! It's a little late, but I wanted to share some photos and a video of the 2nd Annual Big on Beagle's Bash for Cash fundraiser that we attended. 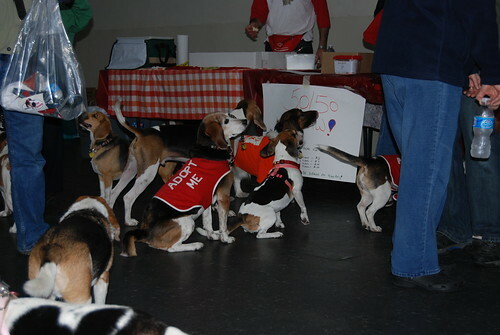 We can't wait for the next Big on Beagle's event so we can show our support again. And I'm sure Duke can't wait to have a howling good time and meet up with his friends again! 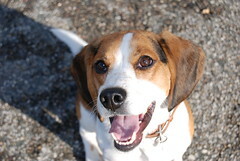 Here's an amazing Beagle named Xsara who has been trained using only positive methods. "If using clicker, first teach her that click is always followed by a reward (in my case food). Start clicking every time she looks at you. You want her to pay attention and think that you are really fun. Never work more than 15 minutes together - beagles get bored. Stop playing when it's most fun and she will always want more. Never play until she gets bored! Plan every step of teaching a trick but make every step easy enough for the dog so that she will feel very smart and confident!" Oopsies Duke was supposed to sit/stay until I turn around and tell him to go down from a distance - this video is Andre and my favourite! This is a scene from the last class of 'Step Ahead' recorded by Duke's classmate, Photon's Dad. In round two of the game, Photon and Phoebe won, going down right after their mom's said the command - amazing! It was a fun games night that included sit-stay-musical chairs, Sparky Says (like Simon Says)and the game above in the video 'Bang'. We played several more games, but I can't remember what they were! It was a really fun night! Second last class last week, before today's fun games night. Last class Andre took the reigns and trained with Duke. A new exercise that Duke failed at was doing 'sit/stays' with having every other dog stay, while the other dogs completed their 'come' command. Unfortunately Duke released from his stay every time the other handlers called 'come' to their dogs, even though it wasn't Duke's turn to 'come'. Amazingly half the dogs were able to maintain their stays even though dogs next to them ran towards their owners. Next the owners and dogs did a heeling exercise where 'watch', 'touch', 'down', 'turns' and 'stand' were commanded while walking. The last exercise of the night was Rally Obedience. Where 2 sets of 3 pylons were set up with 2-3 commands. For example: Sit-down-walk around, Sit-stand, sit-down. The object is to go to each pylon station and try to get your dog to complete the set of commands as fast as possible. Rally Obedience is apparently an up and coming dog sport. Treats as rewards can be used during competition but treats can not be used as lures. Again tonight, Duke's attention and concentration levels weren't great and he was easily distracted. After this course, it's time to work on everything we've learned so that he can do them as fast as he can sit or go down. 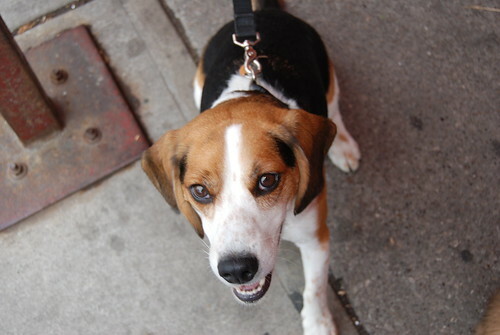 "We adopted our beagle mix, Harvey, from the city shelter about a year ago. He's about 4-5 years old now. He's a great dog, great around strangers, have to watch him a bit around little kids, very easygoing. He is our only pet. We take him on walks in the morning and in the evening, and when we do, we have to always keep an eye out for other dogs because he simply FREAKS OUT when he sees them. Barks, lunges towards them, whines, etc. Most of the time, the other dogs don't respond. We've tried to ignore it, tried to correct him by saying "no," simply try avoiding other dogs by crossing the street or lingering behind cars so he doesn't see them walking. " Duke has this same problem too. It appeared about 2 months after we adopted him and it REALLY, REALLY started getting silly about 6 months of having him in our family. There were times where at the mere sight of a dog - any dog - even a block away - that Duke would lunge, pull, jump, flip, and howl at the top of his lungs and even pull so hard that it sounded like he was gagging himself. Our first mistake was not consulting a professional behavioralist sooner. We should have gotten professional, hands-on assistance well before the 6 month mark but instead we surfed web sites, read discussion forums, bought books from Amazon.com (some were good, many we tried and had no results). Conditioning Duke to look at us when he sees a dog. We started using some very high value treats. The first type of food we used was boiled chicken thighs, shredded into manageable chunks for feeding. Joan took us to a small park across the street full of dogs. We kept our distance from the dogs and we were instructed to feed and praise Duke lavishly every single time Duke looked at us. We also called Duke's name and if he spun around to look at us, we feed and praise. If he does it when a dog is nearby or if he manages to break his gaze from a dog to look at us, he gets TONS of food and praise. There were times where Duke would not turn to look at us and was just too focused on a distraction (ie. a dog). We can pinch his bum or grab his tail (gently), just to get him to turn around and see what I'm doing. Then he gets praise for doing the turnaround. Duke is VERY food motivated and this was easy and fun for him to get started with. It was amazing, even on day 1, because we were in a dog park that had upwards of 2 or 3 dogs walking through at any time and Duke was absolutely fixated on chicken and was quick to "check in" with us. Towards the end of our session as we were leaving the park to return home, we ran into an extremely aggressive/reactive and poorly trained german sheppard in our building which caused both dogs to start barking/lunging uncontrollably. In this sort of situation where Duke's already gone ballistic, we simply turn around and walk away. There's no learning that can happen once he's gone past the point of no return. Just one day of training made our previously frustrating/worrisome task of walking Duke into one that was manageable and increasingly positive and happy! There were ups and downs though. For what seemed like no reason or logic, there would be walks in the AM that were "happy and howl free", and walks that same evening where he howled at half the dogs we spotted. 1) You must believe that your dog will do the right thing! We noticed that if we saw a dog that was approaching and that we felt Duke would go crazy, sure enough he'd lose it. Perhaps it has to do with a change in breathing, pulse, body temperature, or maybe dogs are psychic - bottom line is you have to believe in your dog! Although we had major progress from just the first day of training, it has been really important over the last 4 months to set reasonable expectations and be patient with Duke. He has ups and downs but the overall trend has been extremely positive. Just because he had a good week, doesn't mean it's time to take Duke to a dog parade! Duke can only remain focus and check in for 40 minutes or so at a time (about the length of his walk). After that, it's time to let him relax and have a good game of tug or fetch just to relax. Don't use the same treats every day, change the quantity/portion of treats you give each time - sometimes don't treat at all and just praise. If it becomes a predictable, 1 treat per reward, same treat each time, Duke gets bored. I hope that this blog post helps you if you have the same problem... but if reading books and web sites is not the way to learn how to help your dog if he has leash aggression issues. Please find a behavioralist that uses positive training methods (treats, praise) and get some hands on help. Every single time we walk Duke, we have a treat bag and clicker on hand. We've been walking Duke and praising him for every check in. Over 4 months that's around 360 walks. - Ignores a lot of dogs and doesn't even care about them. - Will spot dogs that get him nervous/excited, but will turn around and look at us as the conditioned response. - Does sometime still lose control on certain dogs (there are a few in the neighbourhood that we know cause him problems), especially un-neutered, intact dogs. 6) Heeling exercise by using a lure and progressively walking in a tighter and tighter circles. Clockwise is used for dogs that lag, and counterclockwise is used for dogs that lead ahead. IT WAS A PACKED NIGHT OF WORK!!!! The funniest part of the evening was during the Sit Stay attention span work, as all the dogs were staying, one of the big houndy-type dogs decided to screw it and stood up and decided to run around in a circle. All the naughty dogs (Duke included) became very distracted!!! -Corinna (the instructor) was having a conversation with at student regarding the COME command. She was suggesting that you could take your dog's meal, divide it in 3, and make him COME and as the reward, give the 1/3rd of the meal to him. Duke's recall is not that good unless it is part of the Sit Stay Come sequence. This weekend on Duke's long, long Sunday walk, we were walking with Leah and her dog (Duke's girlfriend!) Sophie. As we were leaving Trinity-Bellwoods Park, off in the distance, by a tree, we saw the flash of a beagle in the middle of a hunt! He was chasing squirrels and just like Duke, nose to the ground, tail wagging. 1) He used to go off leash in the dog park, but he would run off and get into fights with other dogs or chase mice. 2) Boxers are his enemy! 3) Non-neutered dogs are his enemy! We recently learned from one of the neighbourhood dogwalkers that Non-neutered and Neutered dogs should never interact with one another. A lot of conflict and flights erupt when you mix dogs like that up. If you have a non-neutered dog, PLEASE consider doing the right thing and neutering him. If you can't because you intend to show or breed him, then don't take him to an off-leash community dog park!!! The last lesson of the night was 'Touch'. This is when you hold out the palm of your hand and your dog touches your hand with his/her nose upon the command. I thought it was such a cool trick! It is supposed to help with heeling your dog. To teach touch, hold out your hand (closer to make it easier at first) and when you dog touches your hand with it's nose, mark it w/ a treat/click. Once your dog starts touching your palm with more regularity then you can mark the action with the word 'Touch'. Eventually the palm cn be placed anywhere and the dog will touch it with it's nose. Keep ex-working dogs happy - by keeping them working! We had a chance to check out The Superdogs (http://www.superdogs.com/) at the CNE and one thing we noticed was that the working dog breeds (Border Collies especially) seemed to really, really get excited about performing. This got us thinking about Duke. Our boy is 4 years old now and spent 3 years of his life as working dog. He lived in an outdoor kennel and was never obedience trained and he was only used for hunting. I've noticed that when we go for walks, the more and more I practice obedience lessons with him on the street, the more focused and responsive and well behaved he is. I think he loves being told to sit, heel, stay, come, and rewarded. Duke is most happy when he's working, and even though he's retired from hunting, he's got a new job now! Tonight, we took Duke to the second class in "Step Ahead" class put on by Who's Walking Who (www.whoswalkingwho.net) in Toronto. This class is designed for dogs who have been through basic obedience and is an advanced obedience course for precision work. Duke did OK in certain areas but was very distracted early on in class and on the way in. He eventually settled and did some great work! 1) Put away the lures - We are very dependent on using food in our hands to coax Duke to get into heel position, sit, etc. and we will never progress unless we start phasing out food as a Lure and only as a reward. The quote the instructor, "Anyone can do this (dangle food around) and get their dog to do anything!". 2) Grab his collar and push his bum down - If Duke refuses to sit, or sits and then stands up without permission, its ok to hold his collar and put him down and make him sit. Stay - Put dog in Heel position, use Left hand, palm facing dog's face. Dogs can read your mind so be positive! Our veterinarian and animal communicator believe that dogs are able to read your mind. So, if you are trying to train your beagle or correct your beagle's behavior (ours has a habit of howling at other dogs on the street while on leash), it is very important to have a positive state of mind. If you get into a situation where you think your dog will misbehave, there's a good chance he will! "Duke, here's a chance for you to really impress us!" I find that saying that to myself puts me in a positive state of mind and I am confident that Duke can read our minds!